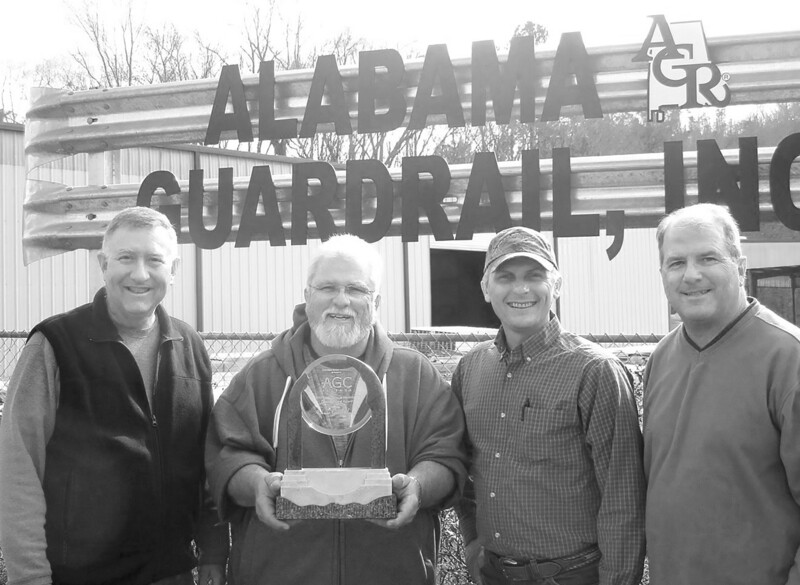 Alabama Guardrail recently received The Association of General Contractors Gary Savage Workforce Development Award for a customized project involving multiple agencies to design and implement a fix for a serious operational problem involving workforce capabilities. Displaying the distinctive trophy above are, from left: contract manager Les Neel, president Keith Dillard, project manager Wes Dillard, and administrator Jack Green. The problem: not enough drivers with CDL license to deliver their product – guardrails – to waiting customers. CDL drivers were available, but all they wanted to do was drive, not help the small installation crew with heavy lifting. Crew members were game to get CDL licenses, but reading comprehension and English as a second language skills were obstacles. The solution: partner with the Alabama Department of Commerce to develop and fund an incumbent worker program and grant; partner with the Alabama Employment Office to administer the program, and; partner with Wallace State Community College to provide specialized, hands-on CDL training addressing the obstacles. The result: A win/win/win/win/win/win/win solution. (1) Successful crew members became qualfied drivers. (2) Crew member/drivers facilitate installation. (3) Product gets delivered/installed quicker, eliminating a production bottleneck and improving cash flow. (4) The plant increases production. (5) Customers are happier because they get their orders sooner. (6) Crew member/drivers are happier because they earn a higher wage. (7) Management is happy twice over (improved efficiency, production, cash flow, etc. and receiving a prestigious award for their initiative in solving a tough problem.) Count ‘em – seven wins, and that’s not even countin’ ‘em aggressively.